Following their addition to Apple.com in the United States last month, Sonos speakers can now be purchased from Apple's website in several other countries. Sonos Wi-Fi-connected PLAY:1 and PLAY:5 speakers are now available on Apple's online store in Australia, Belgium, Canada, France, Germany, Italy, the Netherlands, Spain, Sweden, Switzerland, and the United Kingdom. Prices are set at $249 and $649 in Canada, $299 and $749 in Australia, £169 and £429 in the United Kingdom, and €229 and €579 in many other European countries. Prices may vary based on VAT and other regional taxes. Apple is currently offering a free 3-month Apple Music gift card with the purchase of either speaker. The promotion is valid in the United States and all of the other aforementioned countries and runs until December 31. 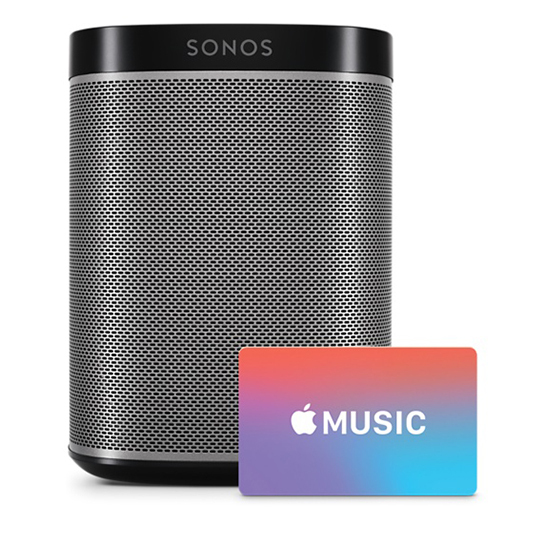 Sonos speakers are also available at 468 physical Apple retail stores in the United States, Australia, Belgium, Canada, France, Germany, Italy, the Netherlands, Spain, Sweden, Switzerland, and the United Kingdom. In-store purchases likewise qualify for the free 3-month Apple Music gift card. Why does Sonos seem like a top player? What are they doing that makes their product worth buying? So decide for yourself. The people that own Sonos equipment overwhelmingly love it. Don't just like it, love it. It's pretty logical that those that own and extoll the positives actually have more basis for their opinions. Nothing needs Siri integration! Siri cant even send a text message to my wife, even when I follow Apple's guidelines to the letter. Bloody thing keeps trying to send an email. Me: Hey Siri, play The Rolling Stones. Goodbye AirPlay - you were never very good. The Airport Express - IIRC - has three possible functions: wi-fi hub/extender, wireless printing, or Airplay. With the demands people put on their wi-fi, the Airport Express doesn't seem to get any traction as a hub. Maybe as an extender??? Don't really know. Printers these days have built in wi-fi, so that's no longer a strong selling point for the Airport Express. That leaves Airplay, for which I currently have four Airport Expresses to send music into different areas of my house. Airport Expresses aren't as reliable as I'd like with Airplay (and I'm using the newest Airport Extreme as my hub). Anyway, I guess my point is that Airplay seems to be the last reason these days to buy an Airport Express, and now that Apple is selling Sonos - a competitor in the Airport Express/Airplay/stereo market - it tells me Apple is giving up on building the hardware for sending music around your home. I miss that one hot minute where Apple was dipping its foot in the home stereo market with the iPod Hi-Fi. No, it wasn't the best speaker. But they were taking risks. And they were cool risks. I like my Play:5 but it's overpriced. At least, I thought it was until I looked into a subwoofer for it. Now I really know what "overpriced" means. I don't think the Play 1, 3, or 5 are overpriced. But the home theatre stuff, and the Connect.... yes i agree with you. I would be very hesitant to invest in a Sonos system given their very shaky financial status. All of those layoffs earlier this year are probably just the tip of the iceberg. Maybe WiFi is better in this regard, but then why not just offer Airplay? 2. Sonos is not limited to operating on the standard home Wifi network. It builds its own wifi mesh network if one of the components is connected to the home network via Ethernet and this helps reliability a lot in large homes and difficult wifi environments.